For a transcript of the Morning Edition audio story, click here. Jen Foundas learned her son William was deaf when he was 6 weeks old. "It was not what I expected," she says. Foundas remembers the audiologist was quick to follow up, telling her that everything was going to be fine, but telling her, "you need to learn American Sign Language." At first, it was overwhelming. In addition to being a new mom who was still trying to get the hang of how to feed, soothe and clothe her brand new baby, she now needed to learn a new language. "And I looked out at William and thought, what does this mean for him? How am I going to do this?" she says. But Foundas was determined. For the last five years she’s been intensively studying American Sign Language (ASL). Today, she’s pretty proficient. According to the National Institutes of Health, more than 90 percent of deaf children are born to hearing parents like the Foundas family. But for a variety of reasons — from access to resources to outdated medical advice — a majority of those parents don’t follow Foundas’ same path. They either don’t learn sign language at all, or they don’t know enough ASL to sign to their kids in a meaningful way. 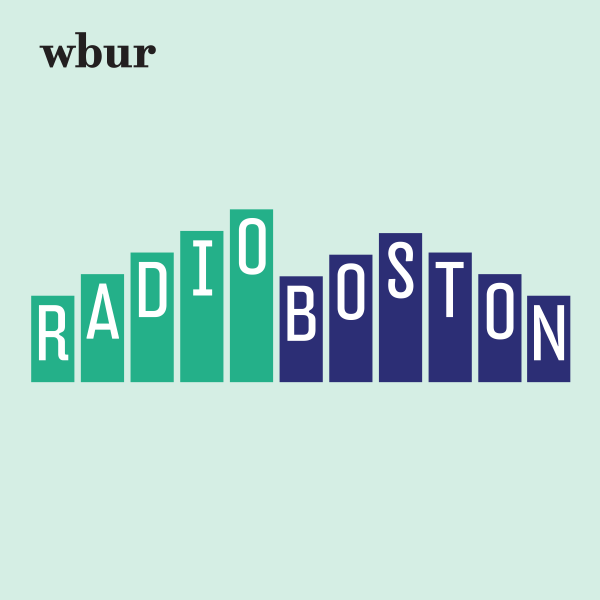 "They’re not included in conversation and they’re not able to process and experience and make use of language," says Patrick Rosenburg, a researcher working with the Language Acquisition and Visual Attention Lab at Boston University. Through an ASL interpreter, he explains that deaf children are not automatically exposed to language in the same way that hearing kids are. And without access to a meaningful amount of language in the early years, kids can suffer from “language deprivation." "Everything ultimately depends on our language capacity," Rosenburg says. We all rely on language for social interactions, reading, school work, even thinking. And if you go long enough without language beyond very basic words, the effects can last a lifetime. 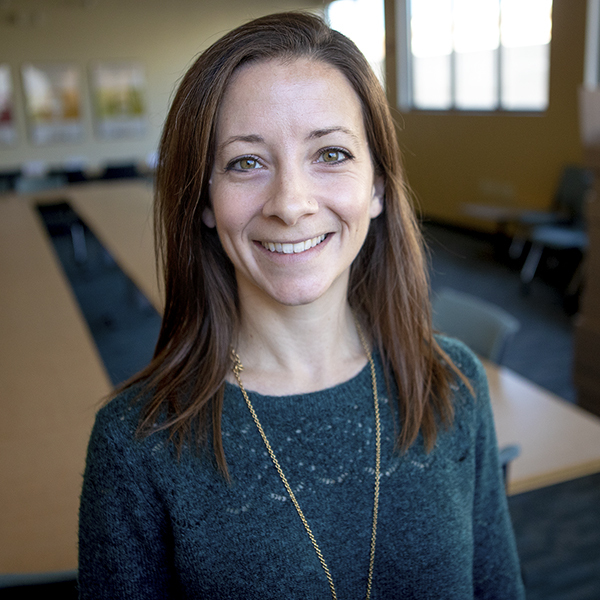 "Language deprivation can have an impact on memory development, on cognitive development, brain developments and cognitive capacity that make it harder for the child to retain [and] to understand things like mathematical representation and literacy," Rosenburg explains. And we can see some of that play out in an achievement gap. Take the third grade English Language Arts test on the MCAS. In 2014, 68 percent of deaf students scored as either needing improvement or failing. Statewide for all third graders that year was 43 percent. Until somewhat recently, there hasn’t been a clear sense among parents and researchers about how and when the very youngest deaf kids fall behind. The main reason: It’s been hard to measure ASL proficiency in babies and toddlers. Rosenburg is currently working with a research team to develop a tool to do just that. "With the appropriate tools we’ll be able to be more responsive in terms of early intervention and providing the correct supports," he says. 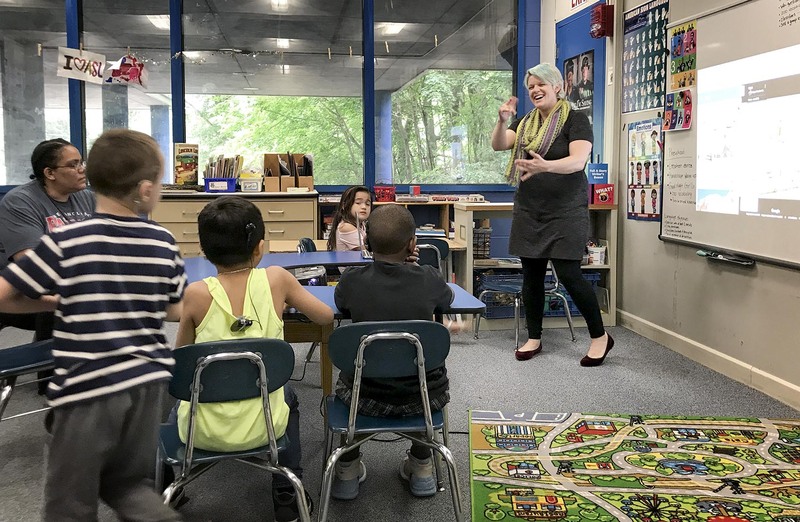 Megan Malzkuhn, an ASL specialist at the Horace Mann School for the Deaf in Boston, adds that because language deprivation is so common among young deaf children today, it poses a unique challenge for educators. "Most, if not all, of our students come in with little to no language," she says through an ASL interpreter. Malzkuhn explains that for those kids, a lot of time is dedicated to getting caught up. "Imagine you’re a first or second grade teacher and you’re trying to teach someone — who doesn’t know how to read and still doesn’t even know their own name — the colors, the numbers, anything," she says. "How are you supposed to teach them the curriculum?" But a relatively new pilot program being implemented at two schools in Massachusetts is showing some promise in closing that disparity. 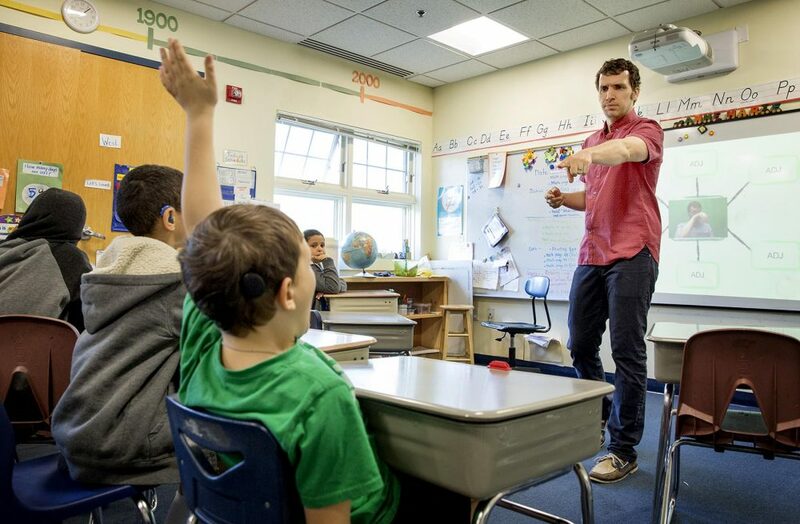 Like Mike Olivier’s second grade classroom at The Learning Center For The Deaf in Framingham, a private school that accepts public school students from districts across the state. In this lesson, he’s standing in front of about seven second graders who have been paired up into three teams. Projected on the white board behind him is a massive grid, like a "Jeopardy!" game board. There are four grammar categories. "Nouns for two," group one signs to Olivier. Olivier clicks into the category using his laptop to bring up a new screen. That brings up a clip of a woman signing a sentence. The kids also see it written in English. "The mouse was eating cheese," signs the woman. The team is tasked with counting the nouns. The two boys huddle behind their desks to discuss. "Two? You saw two nouns?" one boy signs to his partner. Eventually they agree on two as the answer. "Cheese and mouse," they tell Olivier, who responds emphatically: "Yes, very good!" This game is part of a new curriculum being developed by a team at Boston University. 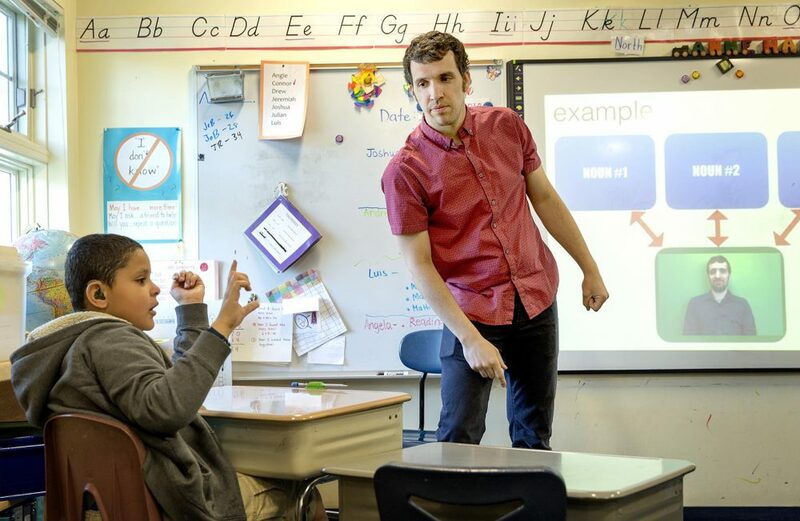 It’s a different approach to traditional language arts because it teaches kids the grammar rules of ASL first. Then it connects those concepts to the rules of written English. Olivier explains it treats ASL more like an academic subject, rather than simply the language of instruction. "The kids are so much more proud of their native language as ASL," he says. "They recognize that ASL has rules and has a structure. I mean you can just see that light bulb has gone off." One of the researchers developing this program, Todd Czubek, adds that this curriculum seems to be working better because it assumes most kids in a class had a later start to learning language. "For the first five years of their life, largely because the world has been inaccessible, kids don’t have the same foundation" as native signers and hearing kids. This new approach essentially is about meeting more children where they are linguistically when they get to school. 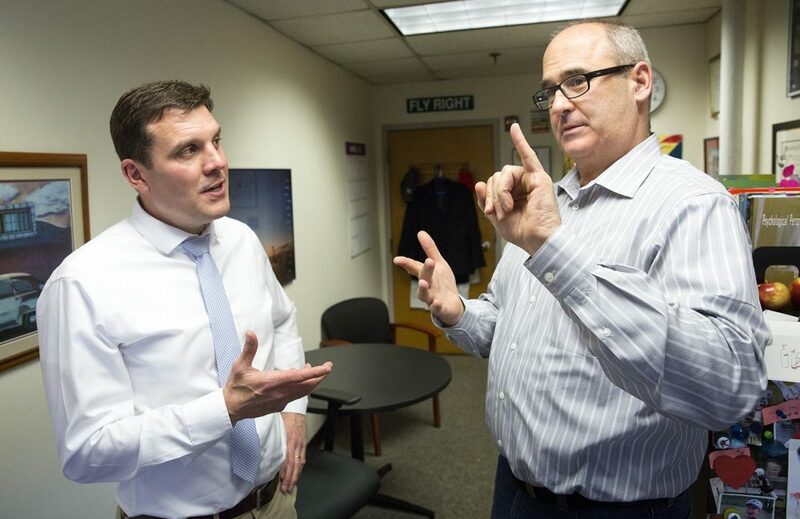 "Our assumptions are based on what’s real for deaf kids," Czubek says. Here in Massachusetts, the schools that are trying this are just one year in, so it’s still too early for results. But the School for the Deaf in Scranton, Pennsylvania, has been using it for five years. Standardized test data there show deaf kids who were born to hearing parents are scoring just as high in reading as their hearing peers, and as deaf kids who have deaf parents. In some ways this approach is part of a larger shift in how the research and medical communities think about language development. Previously, a lot of people thought introducing both ASL and English to their kids would confuse them. But Naomi Caselli, an assistant professor in deaf education at the Wheelock College of Education and Human Development at Boston University, says that seems to be changing. "The goal is to get language to a child," she says. "And whatever means to make that happen is the way to do it." This segment aired on July 23, 2018.